When shopping for a grain mill, there are a number of factors to consider. Noise level, time spent grinding flour, time spent cleaning up, ease of use, range from powdery fine to very coarse grinds, warranty coverage, and, of course, the upfront price. You will have to decide what will work best for your gluten free flour needs. Do you want no hassle, no fuss? Or maybe a machine you can bequeath to your grandchildren? Or perhaps something that performs well no matter what you feed it? Whatever your priorities, realize that this is going to be an investment. Donâ€™t go for the cheapest model just because itâ€™s the cheapest. And donâ€™t go for the most expensive either just because itâ€™s the priciest and therefore the best. It might not be the best option for you. Be smart as you shop and find what you really want. Take some time to save up for it if necessary. What you eventually get will be more than worth it. That said, here are four excellent products to give you an idea of whatâ€™s available on the marketâ€”two electric grain mills, a hand mill, and a blender. All of them have pros and cons. Figure out which one words for you. This electric grain mill can grind 20 cups of non-oily grains or beans at a time using high speed impact. It isnâ€™t unbearably loud (letâ€™s face itâ€”grinding grain is kind of noisy), and the resulting flour can be as fine or as coarse as you want it to be (excepting cereal grinds). The milling chamber cleans itself, but you will need to clean out the rest of the machine with warm water every few usesâ€”not too much trouble at all. A special feature of the Nutrimill Grain Mill is that you can put your grains into the hopper before turning it on. Some electric mills will get plugged up if you do this. Also, the Nutrimill Grain Mill is fairly compact, with 11.5â€ in height and 11â€ by 13â€ footprint. This size makes it easy to store on your countertop or in your cupboard. If you have trouble with it puffing flour all over your kitchen, then go ahead and put a damp towel around it to contain the flour. Also, if you are worried about the flour coming out too hot and thereby losing nutrients (and the flour does heat up), then put your raw grains or beans in the freezer before grinding. The flour will then come out at room temperature. Problem(s) solved. The price is $239.99 on Amazon.com, and it comes with a limited lifetime warranty. Note that it is not suitable for herbs, spices, flaxseeds, chia seeds, fibrous materials, or sprouted foods. Actually, none of the electric grain mills are. This truly beautiful electric grain mill imported from Germany is perhaps the most convenient of any on the market. It is completely self-cleaning, other than a quick brush of its spout every once in a while. To use, just pour the grains into the hopper and push the button. Flour will immediately shoot out of the spout and into the bowl you have placed underneath (no puffs of flour everywhere). For finer or coarser flours, rotate the hopper to the desired setting. 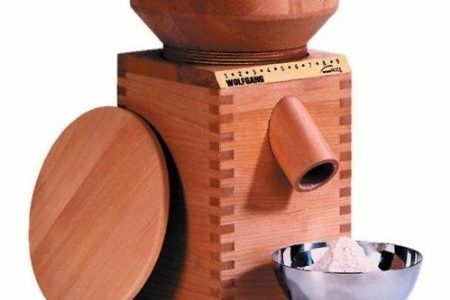 The Tribest Wolfgang Grain Mill is encased in a beech cabinet that will look lovely on any countertop, and it measures 13.25â€ tall. Again, if you are worried about your flour overheating, then put the raw ingredients in the freezer before grinding. And stick to non-oily ingredients and beans. The price is $599.00 on Amazon.com, and has a 3 year warranty. To better compare the Nutrimill Grain Mill and the Tribest Wolfgang Grain Mill, check out Breadtopia Reviews Grain Mills – Part 1 and Breadtopia Reviews Grain Mills – Part 2. This sturdy American-made grain mill will last you a lifetime and beyond. Itâ€™s made of solid metal with a finish that wonâ€™t chip unless you severely abuse it. Itâ€™s easy to clean, quieter than an electric grain mill, and wonâ€™t puff flour everywhere. Also, the resulting flour will be at room temperature (no chance of overheating) and as coarse or as fine as you could wish. However, there are some things to keep in mind. First, it is a hand mill, which means it will take a fair amount of elbow grease to grind your flour. You do have the option of buying the motorizing kit from Country Living, or of making your own motor using a pulley attached to the wheel. Keep in mind, though, that if you make your own motor the lifetime warranty no longer applies. Second, you will need to take some time to install this grain mill upon its arrival to your kitchen. For a thorough explanation of how to go about doing this, check out this YouTube video (Note from the video: You can make superfine flour in one pass with this machine). Third, you wonâ€™t want to use oily ingredients (think chia seeds, flax seeds, and nuts) in this machine. This hand grain mill is $409.00 on Amazon.com and comes with a lifetime warranty. ****If you decide to order it, KEEP IN MIND that the company tests every mill before shipping by GRINDING WHEAT in it to ensure that it is functioning properly. Be sure to make a note that you are gluten intolerant in the requests and concerns portion of the order form. The company will then use a gluten free grain instead. The final option you have available to you is to buy a great blender with a dry blade option. Vitamix has just such a product. The stainless-steel blades for the 32 oz. dry grain container are designed especially for grinding grains, and the cleanup, noise, and speed are just what you would expect from a blender, with settings that are easily adjusted. You gain versatility by going this route, since you can grind both oily and non-oily ingredients for your flours. Finally you can bring out the chia seeds! There are some things to keep in mind. The blender makes the flour really warm, so you really should put the dry ingredients in the freezer before blending. Also, the machine itself does heat up during use and may not be ideal for extended periods of grinding flour. Instructions recommend not running the motor for more than 2 minutes. The Vitamix blender super package (which includes the dry grain container) is $579.99 on Amazon.com. It comes with a 7 year warranty. Check out this Vitamix Demonstration on YouTube for an idea of how well it works.